Have you ever had someone cover a duty, help you out during a crazy time, or maybe they are just an all around great teacher/friend/assistant/co-teacher? In the past, I've wanted to purchase a small "thank you" for my fellow staff members, but I didn't always know what their favorite candy bar, beverage, or hobby happened to be. Today's post is not specific to any grade level or subject. I wanted to share something that is just for fun. This past Christmas, I was in charge of our festivities for the season. A fellow teacher suggested doing a Secret Santa gift exchange. I created a simple little form for each teacher who wanted to participate to fill out. Each person then used that paper to shop for their secret person. After distributing each page to the assigned teacher, I found myself wishing that I had made a copy of the Secret Santa pages for those occasions when I wanted to spend $1-2 just to say thank you! So after a few easy changes to the Secret Santa paper, I created the Thank You Binder! I placed it in the teacher's lounge at our school and told everyone what my intentions were. Inside, there are blank copies in the side pocket and completed copies in the rings. They are all hole punched and ready to go! I love being able to quickly see that a fellow teacher who is having a crazy day loves Big Red. We all need a surprise Polar Pop when you the goin' gets tough, right?! As the end of the school year is quickly approaching, I've been itching to do something for my teacher friends. So, I made a copy of all of the pages in the binder and bought several candy bars at the Dollar General. Each day over the last week or so, I've been leaving these notes on the desks of random teachers. It has been a lot of fun and a great surprise for teachers to walk in to during this end-of-year-crazy time! Like either of these ideas? 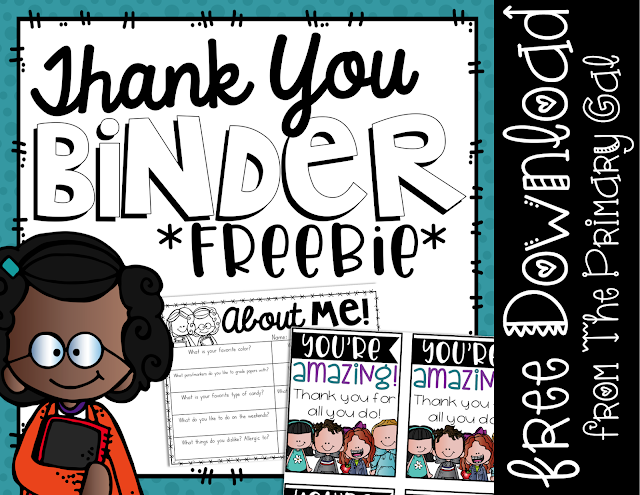 I would love for you to grab the freebies described to help say thank you to your fellow teachers or just boost the morale of your building! This would be so cute to do for the kids, too. Do you happen to have a editable copy of the form so I could change the questions? Awesome blog. You should also monitor this website to know more about writing an argumentative essay.